The Latvian border went quite swiftly as we were able to lane split our way to the front of the queue. The routines were slightly slower than usual and included checking frame numbers from the bikes. We arrived to Riga early in the afternoon, parked the bikes and bought a grilled chicken to be eaten as lunch in the park beside Hotel Latvija. After lunch we were able to drop our gear into deposit at the railway station and take a look at the city. It seems that helmet laws either don’t exist or are not enforced in Latvia, so we decided to leave the helmets also into storage. We met Petri over a beer in the old city, which was filled with outside bars and restaurants. After some sightseeing we decided to pick up our gear and ride outside the city to bush camp. Most of the area aound Riga is swamp but we were able to find a dry spot for the tents. Of course, this wasn’t a problem for Bergie’s hammock. We continued riding helmetless in the following morning and hit a police raid. However we were not even pulled over while they seemed to be stopping all the cars. 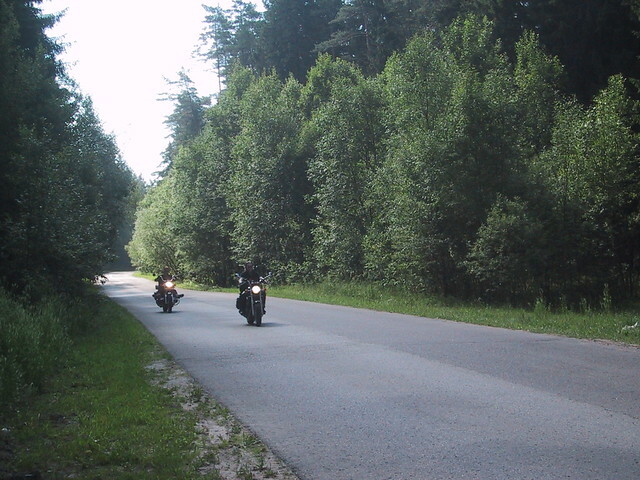 The Lithuanian border went past swiftly and we continued towards Poland. Via Baltica was in good condition both in Latvia and Lithuania, despite occasional road works. There were several new bypass roads that were not visible on the GPS maps. There was a several hour queue at the Polish border. However, we were again able to lane split our way, shortening the wait to only one and half hours. Most people gave way to us easily in the queue, but one tourist bus tried to bock us. Luckily another bus driver came to clear the situation and we were able to proceed. 08 July 2002 in Pärnu, Estonia. 2 minute read.